What is the Future of Small-Scale Anaerobic Digestion? Although biomethanisation was considered unprofitable a few years ago, it is growing today with a new model of biogas production: small-scale digestion (or micro-scale digestion). All over Europe, farmer organizations and political bodies recognize the value of micro-scale digestion. By the end of 2016, 130 micro-scale digestion facilities were in operation in Europe. Smaller, less expensive, easily self-sufficient, these production units attract farmers, but also investors in eco-neighborhoods, wishing to develop new sources of clean energy. While the low market value of biomethane hindered the development of micro-scale digestion, the revision of electricity feed-in tariffs, which were applied in January 2016, offers great potential for the development. Today’s trends: modular approaches (e.g. in containers), mobile units and “plug and play”. benefit from the advantages of digestate: more liquid material and therefore easier to spread, fewer weeds and mineralized nitrogen, etc. In France, this energy alternative is becoming very successful, particularly in Brittany, where a dozen projects are planned. For farmers, small-scale digestion is a good way to diversify their activity at a reasonable cost. Until recently, the costs of a biogas plant were hampering farmers in opting for micro-scale digestion. However, since December 13, 2016, a decree fixes the new rules for the electricity feed-in tariffs generated from methanisation, which has helped reassure potential investors. Farmers now benefit from a resale tariff of 0.175 € / kWh. 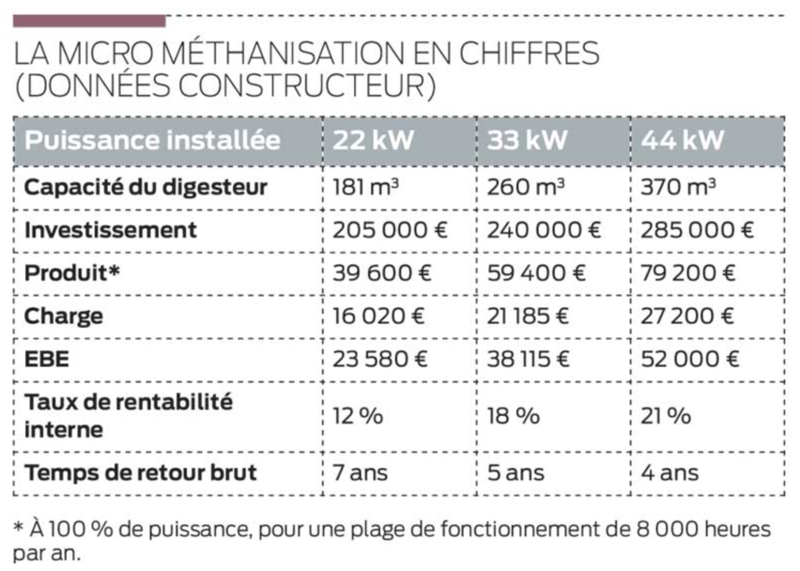 They are also entitled to a premium of 0.05 € / kWh if they transform more than 60% of the residues of their activity. Starting at € 220,000, a farmer can now install a 22 kW power station on his farm. To achieve the objectives of the Energy Transition Law, the Government also decided in February 2016 to extend the duration of electricity purchase contracts produced by methanisation from 15 to 20 years. In France, one of the challenges in the years to come will be to develop small-scale digestion in cities. Several companies have created small-scale digesters and stations for the treatment of organic waste adapted to urban spaces. In Britain, HomeBiogas, located and manufactured in Israel, has developed an anaerobic digester specifically designed for domestic use, in which food waste is converted into biogas and fertilizer. Six liters of food waste per day is needed to feed it. The biogas produced can thus be used for cooking, heating and even lighting. HomeBiogas systems have already been installed in several eco-districts in Great Britain and close to 1,000 family sized Biogas systems have been deployed to over 75 countries in the last 2 years. The new model, HomeBiogas 2.0, offers a larger micro-scale of Biogas production- it can digest up to 36 Liters of animal manure and/or up to 12 Liters of kitchen waste. However, a legal framework should be applied in order to develop micro-small digestion in cities. The legal framework must allow small-scale digestion in urban space, although the development of renewable energies is still defended by the French government. Funded by the European Union under the Intelligent Energy Europe Programme, the project BioEnergy Farm 2 aims to open the market for micro-scale digestion. The project was carried out by a quite large consortium, representing 7 European countries. The project objective is to assist 700 farmers in checking the feasibility of their project by doing business plans. The project has played an important role in producing and sharing knowledge about all aspects regarding small scale digestion. Bioenergy Farm also presents a report on the whole market for the various small-scale digestion technologies and assesses the development potential of 13 European countries. HoSt launched a few years ago the Microferm, designed for agriculturalists who want to process manure on a small scale, and to convert it to sustainable energy. Depending on the size of the company, the farm can produce between 60 and 150 kWe green energy. Apart from the production of electricity and heat, the formed biogas can also be upgraded to natural gas quality and be supplied to the natural gas grid. Biolectric developed a standard technology for small scale digestion to transform liquid manure into odor-reduced, nutrient-reduced, biologically active fertilizer. Bioelectric’s technologies are adapted for a 100-cows dairy. Their solutions can also work with duck or pork manures. More than 100 Biolectric installations are currently operating in Europe. Here are some small scale digestion unit producers in France: BIO4GAZ, VALOGREEN, AGRIKOMP, ARKOLIA, EVALOR, KUB Process, ENERPRO. – What steps should I follow to achieve my project? – What technology should be chosen and what size adapted to my operation? – What legislation applies to my project and what assistance can I get? – What financial assistance can I get for my project? – How can I ensure that the project is profitable? BiogasWorld will be pleased to help you to achieve your microbiomethanisation project, particularly by connecting you to the product and service suppliers. For more information, please contact Nikolas at sales@biogasworld.com. La Tribune: Micro-méthaniseurs : la solution pour mieux valoriser les déchets en ville ? l’EnerGEEK: Micro-méthanisation : une opportunité énergétique sérieuse ? Le-Gaz: La micro-méthanisation prendra-t-elle son envol en france ?